Messier Marathon Holders: Please submit any scheduled Messier Marathon 2019 Events! Messier Marathon is a term describing the attempt to find as many Messier objects as possible in one night. Depending on the location of the observer, and season, there is a different number of them visible, as they are not evenly distributed in the celestial sphere. There are heavily crowded regions in the sky, especially the Virgo Cluster and the region around the Galactic Center, while other regions are virtually empty of them. In particular, there are no Messier objects at all at Right Ascensions 21:40 to 23:20, and only the very northern M52 is between RA 21:40 and 0:40. This chance effect leads, at considerably low northern latitudes on Earth (best around 25 degrees North), to the chance to observe all 110 Messier objects in one night! This opportunity occurs once every year, around mid- to end-March; the best time to try is of course when the Moon is near its new phase. For the upcoming years until 2100, we give best Messier Marathon dates here. Note: Most Messier Marathoners accept NGC 5866 as M102, either in account of historical evidence, or at least as substitute accepted for the Messier Marathon, and thus arrive at actually 110 different objects. We recommend to do so, but you decide what you want to do. Note2: Referring to the objects M51B (NGC 5195) and M109B (NGC 3953): Virtually all observers of M51 will also see M51B. For the M109/M109B discussion, we propose to recognize as "score" either of the objects, M109 (NGC 3992) or M109B (NGC 3953), or certainly both. Messier Marathon was invented independently by several North American (including Tom Hoffelder, Tom Reiland and Don Machholz) and perhaps one Spanish amateur astronomers and groups, in the 1970s. It was probably first in the night of March 23/24, 1985 that Gerry Rattley from Dugas, Arizona, completed the list and hunted down all 110 Messier Objects in one night; while he was the first to achieve this goal, it was only about one hour later that Rick Hull duplicated this success from Anza, California. This is however possible only under exceptionally good observing conditions, and at a preferred location. Anyway, some Messier Marathon tips may help to be [even] more successful with this endeavor, i.e., see one or a few objects more. Meanwhile, a number of clubs started to hold more considerable Messier Marathon events, notably in Arizona. In 1981, the Saguaro Astronomy Club (SAC) held their first Messier Marathon with about 40 participants, the first in a row of meanwhile 27 events (as of 2015) sponsored by this club; Gerry Rattley's first 110 objects success of 1985 happened on their fourth event. Since 1993, SAC sponsors the famous All Arizona Messier Marathons held annually, first near Arizona City, later from a site west of Phoenix, the Salome E mergency Airstrip (aka The Hovatter Airstrip). These events have been organized by A.J. Crayon for decades, and now by Rick Tejera and helpers. Other clubs throughout the world are also holding their Messier Marathon events semi-annually. The more complete Messier Marathon history can be found in Don Machholz's booklet, The Messier Marathon Observer's Guide (Machholz 1994), or its newer edition or successor, The Observing Guide to the Messier Marathon (Machholz 2002), which moreover gives a most useful proposition for the search sequence. It also points out that less complete Messier Marathons may be run at every time in the year, the percentage depending on location and time. Southerners may prefer other marathons. For the time around September each year, there is another 110-object marathon for mid-northern observers, the Messier Plus Marathon (compiled by Wally Brown and Bob Buckner). We have a list of additional deepsky objects for those who want to observe more objects during Messier Marathon nights. Stephen Saber has proposed to add objects from Patrick Moore's Caldwell Object list for a Messier-Caldwell Marathon (local list copy). Other experienced observers have compiled more massive lists for marathoning up to over 500 objects a night; Don Machholz reports that he hunted down 599 deep-sky splendors in one night ! Tom Polakis has investigated the observing window for finding all 110, depending on geographic latitude (Polakis 2006). Since their invention, Messier Marathons had to face some opposition. As Don Machholz points out, the major complaint is that "rushing through a Messier [or other] list does not allow to study each" object seriously. However, as nothing prevents you from returning to them, and studying them with more time, in other nights, "such criticism can be ignored, since the Messier Marathon is not designed for everyone. The critic can spend the night looking at a shorter list of wonders. A counterpoint to this resistance is that the Marathoner will see nearly all the Messier Catalogue in one night -- many amateur astronomers [and even more professionals, believe me - hf :-)] never see the whole catalogue in their whole lifetime. Additionally, one's searching and locating skills, necessary in most aspects of astronomy, are sharpened during the Marathon. The benefit of seeing, in one night, the major building blocks of our Galaxy: open and globular clusters, diffuse and planetary nebulae, along with other galaxies, cannot be ignored. Finally, there is a satisfaction of working with others toward a common goal, and then finally achieving it [hopefully !]." Rumors say that there are some hardliners who feel the same satisfaction when they do it alone..
Marathons are of course enriched if other appealing celestial events can fill in the pauses which normally occur if you have hunted down everything you can at a time, and wait for the morning objects to rise. In 1997, the outstanding naked-eye comet Hale-Bopp (C/1995O1) gave an extraordinary spectacle exactly at Messier Marathon time in March and April, to celebrate the Messier Marathon's 20th birthday, similar to 1996's Hyakutake (C/1996B2). In 1998, there was no such bright comet, but a considerable supernova, SN 1998S in NGC 3877 (in Ursa Major), had timely occured and brightened up to 12th magnitude to enrich the Messier Marathon. In 2002, there occured two remarkable add-ons just in time: the most remarkable supernova 2002ap occurred in M74 in late January, and comet C/2002 C1 (Ikeya-Zhang) was discovered, and brightened to naked-eye visibility in March and April! In 2006, supernova 2006X flashed up in M100 in early February, as for 2009 did SN 2008in in M61, in 2012 it was SN 2012aw in M95; these were all giving an interesting addition of the marathon. In 2013, bright comet C/2011 L4 (PANSTARRS) has delivered its show. In 2014, two supernova have occurred in Messier galaxies: Bright SN 2014J in M82 and SN 2014L in M99. We don't know in advance what extras will give future Messier Marathons additional value, but intend to provide the relevant information here as soon as it is available. Check for more info on upcoming or current Messier Marathons: Messier Marathon 2019. Another common extension of the Messier Marathon is to add a solar system marathon, i.e. to try to observe as many of the 8 planets besides Earth during the Messier Marathon night (e.g., 1999 to 2004 offered the opportunity to find all 8). 2006 to 2008 may have been the last opportunities to achieve the Nine-Planet goal; then Uranus and later Neptune will be too close to the Sun during Messier Marathon time for a considerable number of years, until about the 2040s, but there always remain some of them. There have been several propositions to make the Messier Marathon more challenging for those who do it repeated times. An interesting proposition was brought to my attention by Tom Hoffelder one of the Messier Marathon inventors. He points out that he and his friend Greg Zentz, who has also completed a number of Marathons, came up with the idea of doing it completely from memory. This would mean no star charts or notes of any kind, only a list of the objects in order of search. They are thinking of trying it and calling it "M cubed" (Messier Memory Marathon). On March 29-30, 2003, Don Machholz was the first marathoner to achieve a more notable success in a "M cubed" marathon, as he hunted down as many as 108 Messier objects from memory without any further help. On March 25/26, 2004, it was again Don Machholz who successfully did the first full 110-object score in a "M cubed." Marathoner and A.L. Master Observer Stephen Saber has also been running the M-Cubed for several years. His method adds the memorization of the entire search sequence. Another interesting possibility is running a photographic Messier Marathon. This was, to our knowledge, first undertaken by Tim Hunter and Dan Knauss of Grasslands Observatory, Arizona in March 1988; see their report and photo album. Phil Harrington's Planning Your Messier Marathon page, containing the slightly different sequence which was printed in the March 1994 issue of Astronomy magazine. Dawn Jenkins has made useful hints available how to hold a Messier marathon, and provided her own marathon sequence, as part of her general observing page. David Levy, in his book The Sky: A User's Guide (Levy 1991), also gives a slightly different sequence (which he quotes to Don Machholz and John Kerns); pp. 222-225 of his book contain this list together with his 1983 results. COAA (Algarve, Portugal) provides the Windows 3.x (up) program MESSMARA, which creates graphs and lists on which Messier objects can be seen from a particular location in a given night. We collect actual Messier Marathon observer's results ! Look at our All Reported Results Table! Messier Marathon Eternal Hall of Fame - all reported Messier Marathon results with full success of 110 observed Messier Objects! A.J. Crayon has provided a comprehensive Analysis of Messier Marathons (derived from these results) - the 2015 update is available now! Please notify me if you'd like to have your result/score/report/link/addition/correction to be added ! If you have observed all Messier objects, even not in one night all together, we encourage you to announce this fact on your hompage in the web. You are then granted the right to use a specific logo certifying that you have observed all 110 Messier objects. Don Machholz, 2002. 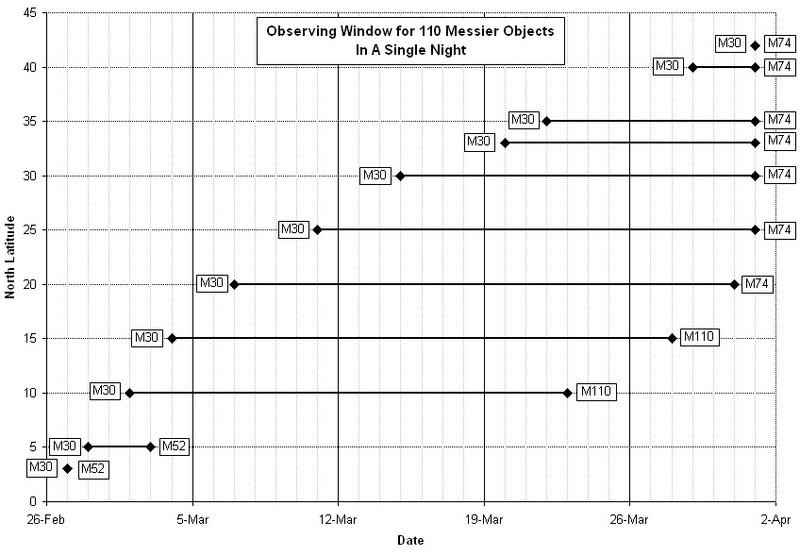 The Observing Guide to the Messier Marathon. A Handbook and Atlas. Cambridge University Press. [ADS: 2002ogmm.book.....M] Second, enhanced and extended edition of Machholz (1994). Tom Polakis, 2006. Messier Marathon Observing Window. Posted to the Yahoo group amastro on February 7, 2006.